OCLC has established a partnership with Plum Analytics, an altmetrics organization that develops analytical tools for scholars and researchers, to leverage WorldCat data to help researchers better analyze and measure the impact of their work. 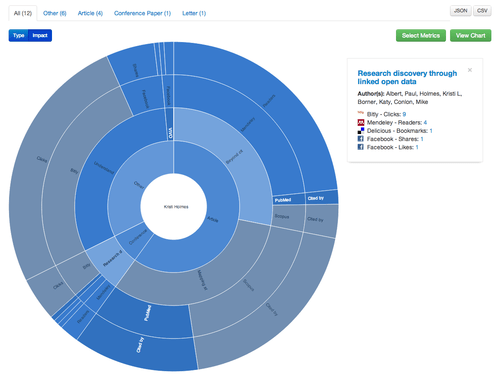 PlumX is an analysis tool aimed at helping libraries and research administrators understand the influence of their researchers’ work by using newer alternative metrics, called altmetrics, alongside traditional measures of research impact. To learn more about PlumAnalyics and the PlumX application, visit the Plum Analytics website at www.plumanalytics.com.